I picked this one up because of the title. I really can be that shallow sometimes. That it was a cyberpunk-style science-fiction book only made me more keen to pick it up. It was only later that I realised that the Internet had pretty much nothing on the novel. As far as I know, its only presence until now was the Amazon page. So this is kinda weird, knowing that this is possibly the first review of This One's a Lemon out there. I only hope I get this right. 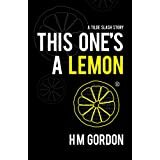 This One's a Lemon is the first in the Tilde Slash trilogy.Set in the near future of an alternate timeline in which Europe and America essentially collapsed in on themselves in the years 2000-2010, it follows the aforementioned Tilde Slash. She's a small-time hacker who specialises in the extraction of data and programmes, so it's not unusual for someone to ask her to find their late husband's missing software. What makes it interesting is that his programme might well be the key to uploading the human consciousness and personality onto the Internet. It's the sort of thing that attracts the attention of people other than Tilde's client: for example, Lemon Computers, the dead programmer's former employers, who are quite keen to get their data back. As a plot, I was expecting this to be far more direct than it turned out to be. While the action does keep moving at a fairly brisk pace, it does so in a rather indirect manner; it seems to move Tilde and the other characters from set piece to set piece quickly, but few of these set pieces clearly advance you in figuring out the plot as a whole. It's a weird mix of action and mystery that I want to define as a thriller, but can't quite commit to. There's also a romance sub-plot that actually works really well within the context of the novel: it's in no way sappy or sentimental, and it fits perfectly with what we know about the character of Tilde. The characters are, for the most part, kind of uneven. Tilde and her love interest introduced later in the book are the ones that are developed the most, and it really shows. For those two, their dialogue and relationship seem organic and subtle; most of the other characters are given 2-4 chapters in the entire narrative to really interact with Tilde, which doesn't leave much room for fantastic character development. I kind of wish that some of the characters could have been saved for a later book in exchange for more development time. The same goes for a fair few plot elements that are introduced as events progress, but aren't really examined too closely due to lack of space. If given the choice of two extremes, then I would rather plump for too many ideas in too little space as opposed to the other way around, but it's still mildly disappointing when it happens.